Official development assistance (ODA) and charity alone can’t meet the world’s development needs. With the United Nations estimating its 2030 sustainable development goals (SDGs) will cost up to $7tn a year, developing countries are being forced to look elsewhere, including to the private sector, to raise the cash they need. The good news is that private investors are increasingly driven by social goals, and not just profits. And the global mass movement of people to cities and growth of the middle class is making such investment more pressing and profitable. The bad news is that available capital is not making its way quickly enough or at a large enough scale to sustainable projects in less- developed countries. The UN-led ‘Financing for Development’ (FfD) process - which culminated in the 2015 Addis Ababa Action Agenda - calls for a more even mix of official aid, charity, private investment, trade policy and domestic resources (such as tax revenues). The idea of ‘blended finance’ is starting to take hold in the development sector as a way to encourage private investment - essentially, leveraging public money to cover investors’ potential losses. 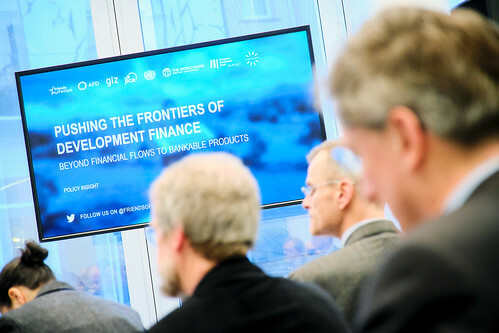 At Friends of Europe’s event, ‘Pushing the frontiers of development finance’, panellists discussed how to use innovative financial products - like the European Investment Bank’s (EIB) ‘sustainability awareness bonds’ - to bridge the investment gap in poorer countries. This report condenses that event, which took place on 7 February, into a few key recommendations for EU development policy.